Finding it hard to get your kids to do chores around the household? 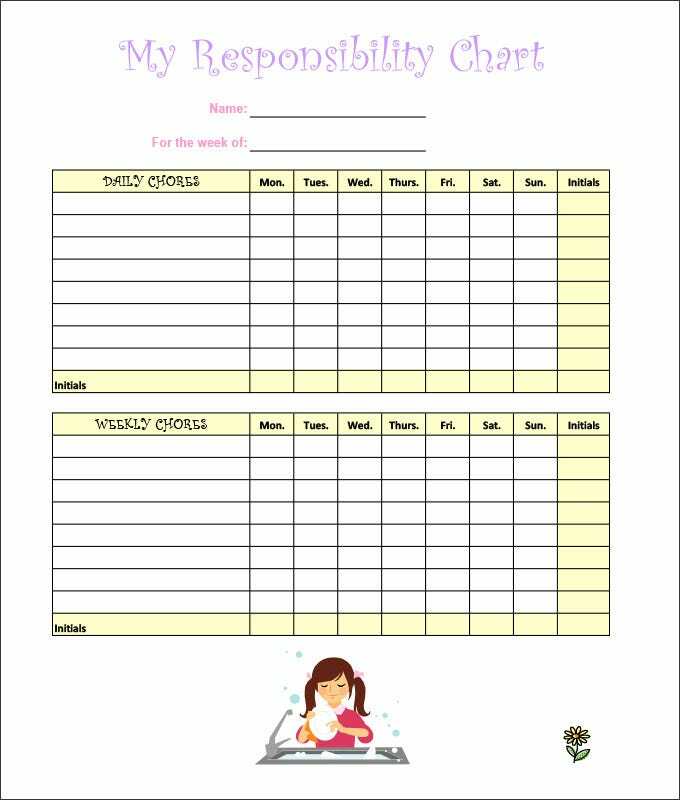 Well invoke their interest and let your kids have fun doing chores with the kids chore chart template. Available in numerous interesting themes, the templates combine kids’ favorite cartoon characters with dull ‘to-do’ chore lists and make a perfect combination for a chore chart. The templates come in ready to print formats that require the least bit editing and can be instantly downloaded. You may also check Chore Chart Templates. Choosing an appealing Kids Chore Chart is important to make your kid follow it. Kids, by nature, get swept away by colorful things. This template uses gentle colors in a subtle manner to attract children. So, if your kid is amongst those who loathe gaudy designs then this template will certainly impress him. Just give it a try! You may also visit Excel Chart Templates. The USP of this Simple Chore Chart for Kids is its simplistic design. A light blue shade has been used to create the content of this template which prevents it from looking tacky. It is ideal for small kids who fail to appreciate complexity in both design and content. Essentially, there is a list of chores in the template that needs to be ticked off. 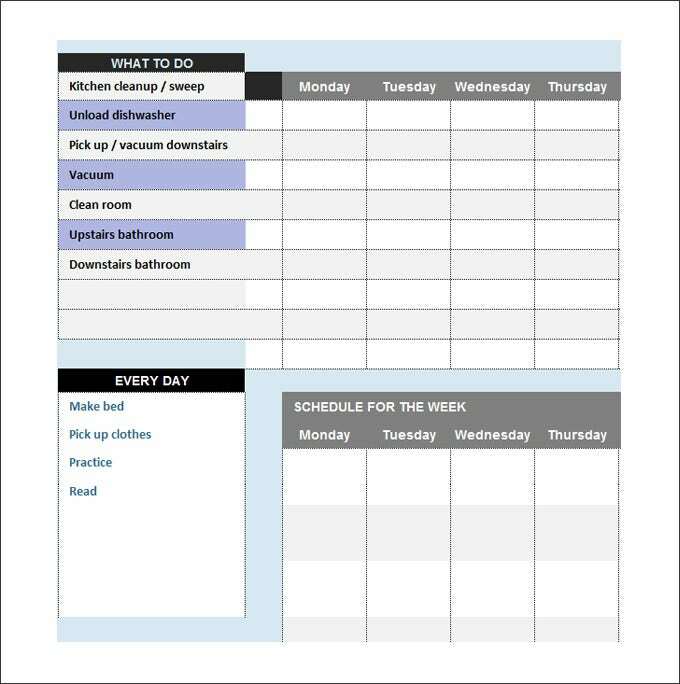 With ready printability, this Printable Chore Chart Template is an ideal choice for many. The illustration of a girl cleaning dishes at the bottom is the highlight of the template. Besides, there is a picture of flower in the extreme right. Subtle use of colors makes the template a treat to the eyes. Simply setup the heading of the chore chart, assign titles to the columns, decide on the number of rows and insert the chores to be performed, and voila! You’re all set to creating your very own kids chore chart. The templates allow users to also add their own personal images and include customized fonts and colors to the template as well. The free and Customisable chart templates are available in all sizes and can be download free and printed Blank Charts instantly. And most templates can be edited online without any prior experience in Photoshop or any other design software. 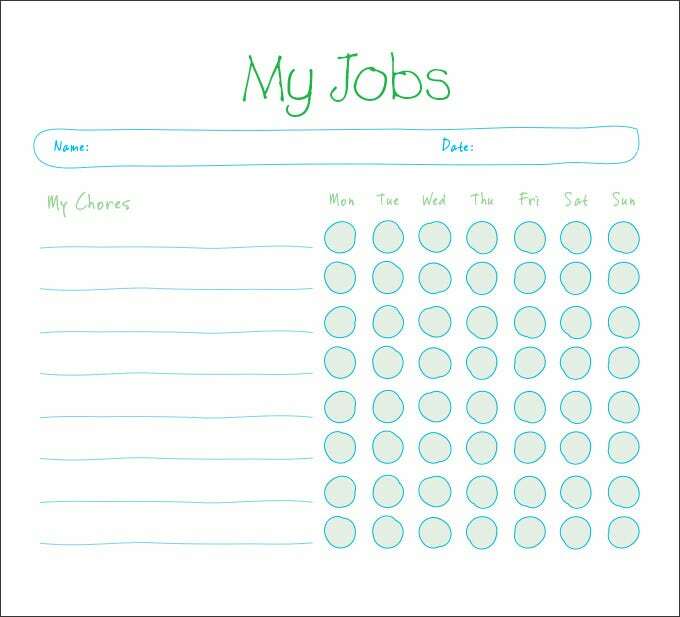 Also share the chore chart templates via email and download them from any place across the globe. When there is nothing useful to do at home, kids get bored and start idling away time watching TV or eating unhealthy food. Never let your child idle away spare time. Engage them into something productive. 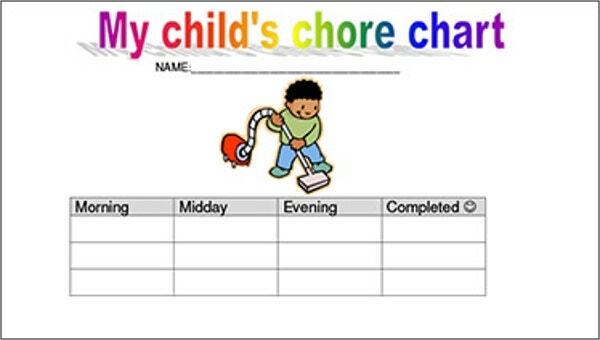 You can also help your child develop interest in chores with amazing kid chore chart templates. These templates have been created keeping in mind a child’s interest areas. Incorporation of animated characters makes these templates all the more desirable. These templates are so appealing that your child will never say no to any chore. So, engage your kids in chores using this easy technique. 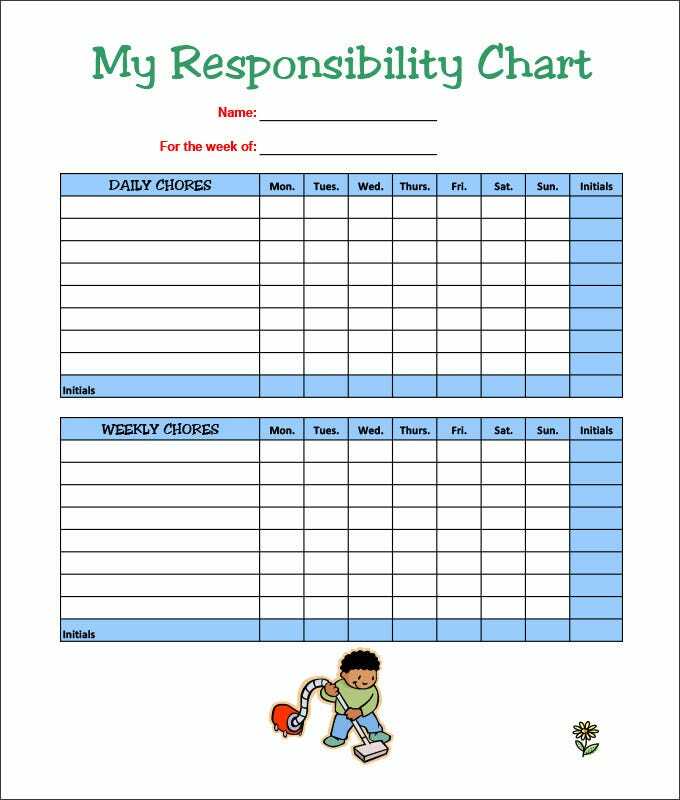 Kids-Chore-Chart-Templates are available in so many varieties online that you will never run out of choices. If you want the template to appeal to your kid as well, you can make him sit in front of the computer along with you to help make a choice. This way, your kid will develop attachment towards the template, which might help him stick to it. If you have any DMCA issues on this post, please contact us!